I guess it’s fair to say that I have an obsession with chicken wings as like someone would over fried chicken. There’s this hole-in-the-wall restaurant in Vancouver that has been serving up some serious crack chicken wings for the past couple decades. Phnom Penh 金邊小館 is located in Chinatown and there is never a shortage of people lining up – a casual rainy weeknight will set you back at least 40 minutes. Yet we all happily comply! I think it’s partly because of their garlic butter sauce; and partly because of their crack dipping sauce that makes their wings so addictive! To make these super delicious chicken wings at home a little healthier, I don’t use any powdered MSG. I substituted the umami flavour with a little fish sauce (I like using this one most) and sugar. 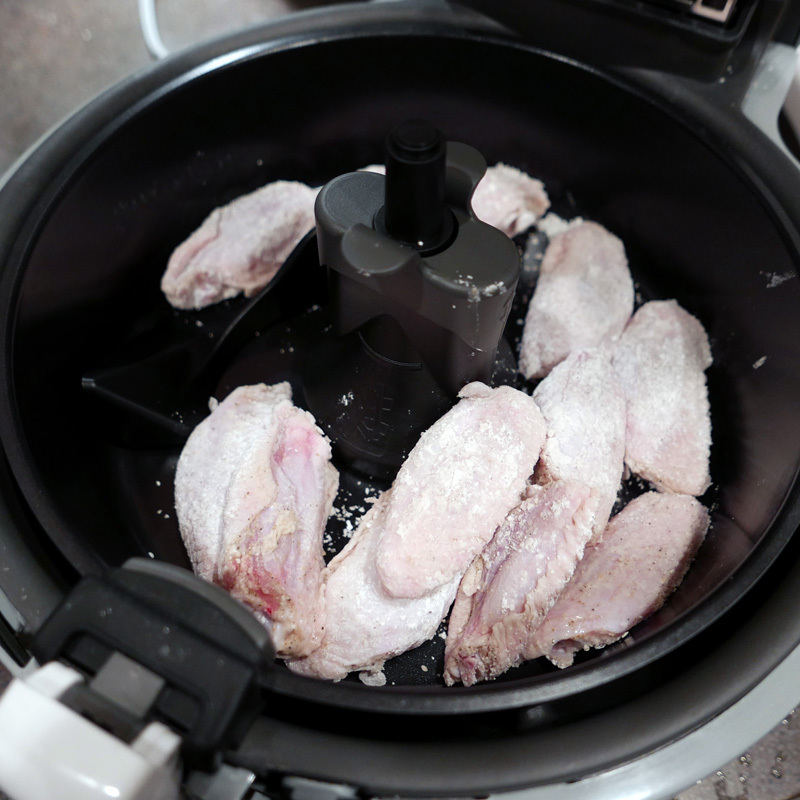 I also replaced deep frying the chicken wings in hot oil with an air fryer (similar here). These chicken wings are dead easy to make. They are light and crispy! A little tangy and sweet! The skin has a nice sugary crunch! It’s almost magic! All you need is some five minutes of prep time and 25 minutes of cooking time in the Actifry (you barely even have to lift a finger! You can go and enjoy that glass of wine and Netflix). For the marinade, you will need a splash of fish sauce, sugar, corn starch, salt and pepper. For the dipping sauce you will need lime, white pepper powder and black pepper salt (I use Wu Hsing brand but you can find similar ones at any Asian supermarket). You can also use regular ground black pepper if you can’t find it. I highly encourage you to make extra dipping sauce… you’ll want to double dip! 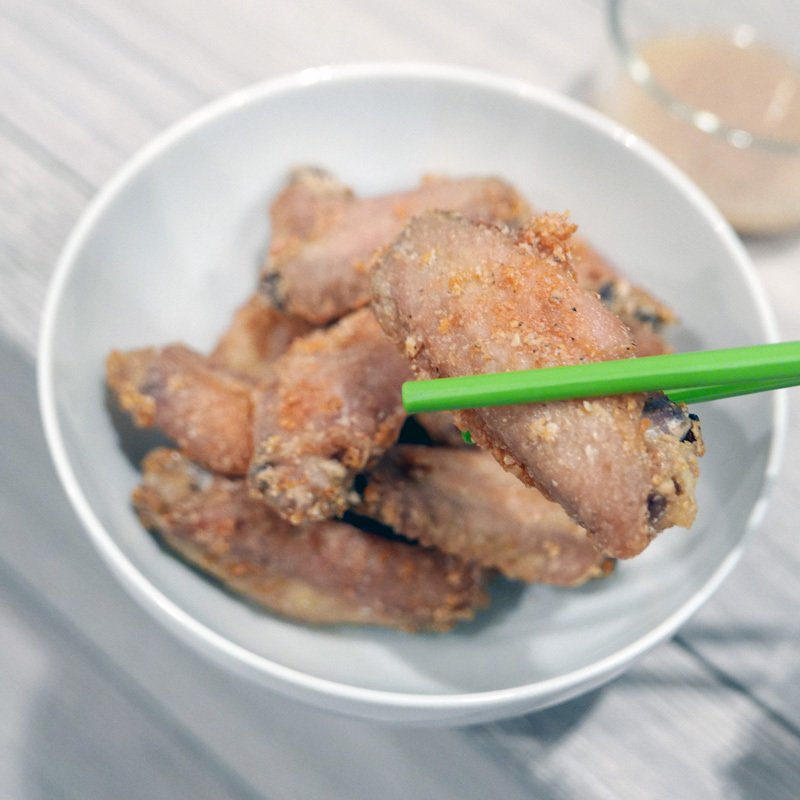 Phnom Penh Cambodian style fried chicken wings recipe – light and crispy. Easy to make in 30 minutes. 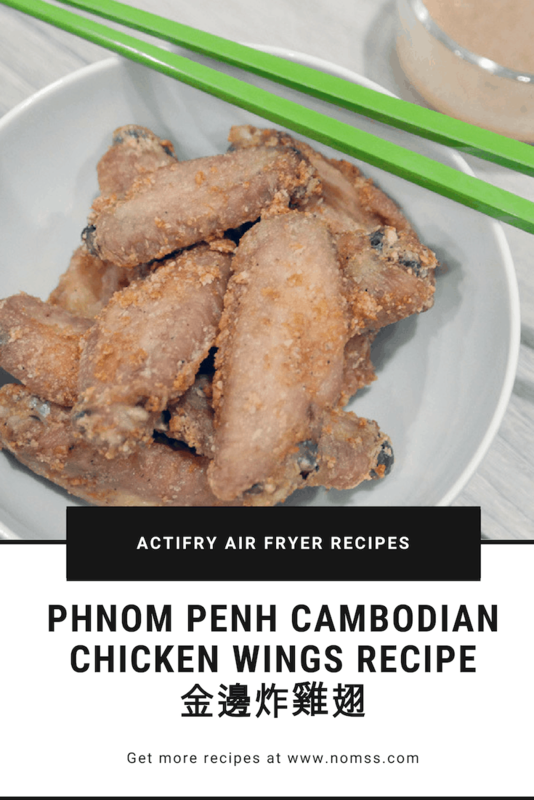 Actifry Air Fryer recipe. In a large mixing bowl, mix fish sauce, sugar, salt and pepper, and minced garlic. In a large bowl, place corn starch and coat the chicken wings. Shake off excess flour. Add 1 tbsp of butter if you want that extra garlic butter flavour. For a healthier version, you do not need to add any oil. The chicken wings will give off enough oil for cooking. 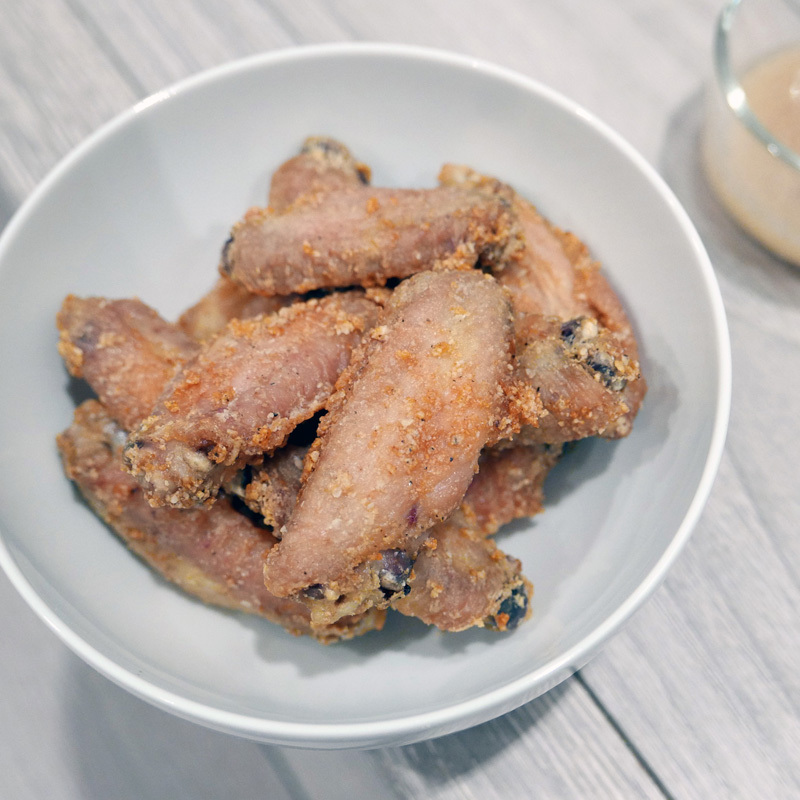 Using a pair of tongs, add the chicken wings to the air fryer pan. Turn on Actifry and set timer to 25 minutes. Enjoy that glass of wine and come back with the timer beeps. On a rack or paper towels, let the chicken wings rest for a few minutes. Be careful – the chicken wings are VERY HOT straight out of the air fryer! You do not want to burn your tongue! In a small bowl, whisk together lime juice, white pepper powder and black pepper salt. You will want enough pepper so that the lime juice turn into a grey-ish colour. Dip your wings in that peppery lime sauce and enjoy! If you do not have an air fryer you can bake the chicken wings for 45 minutes at 420F. Flipping every 20 to 30 mins. Pin the above image to your Fried Chicken or Air Fryer recipe board to bookmark this page. We are so excited to share our recipes with you!